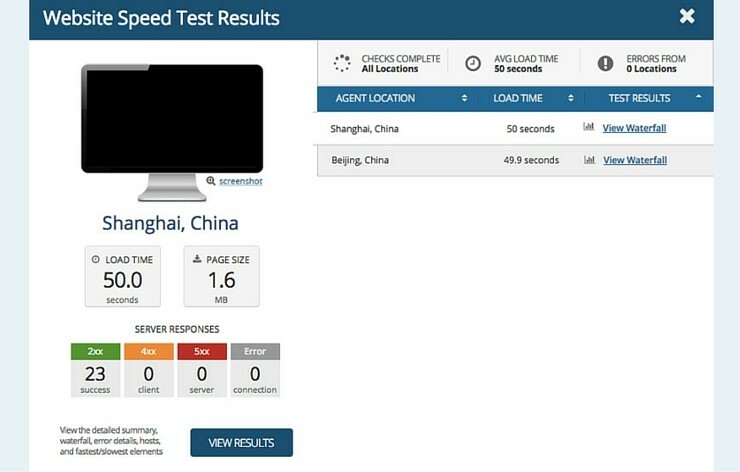 Is your website slow in China? Are you asking yourself if you need a separate website for the Chinese market? I might have just the answer for you. During the first meetings with our customers, the main topic revolves around the go-to-market strategy for their website. The main dilemma for most is to choose between having a dedicated Chinese website or just a Chinese version on their official website. In this article I will outline some of the most important aspects on why having a dedicated Chinese website is useful to you from a multitude of perspectives – brand presence, technical issues. In addition to that, I will share some of the potential downsides of having one website to serve both your home market and the Chinese market. 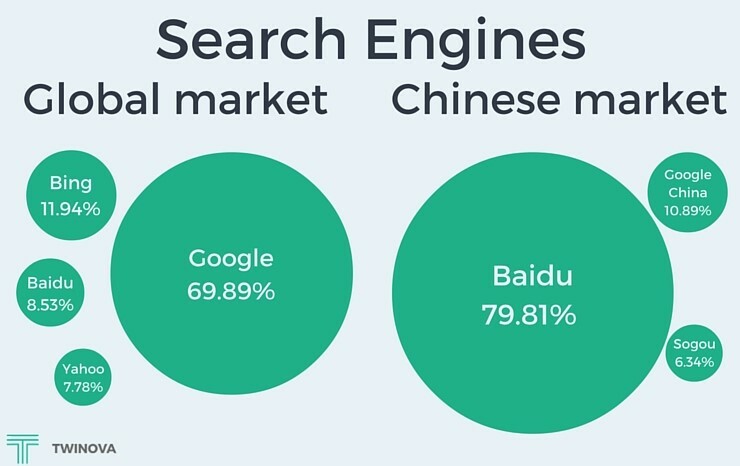 China’s search engine market is dominated by Baidu. The undisputed leader, had in Q2 2015 a market share of 79.81%. As you might expect, netizens use keywords in Chinese to search on Baidu. Two search engines are not the same, as their algorithm differs significantly. Clearly, Google and Baidu are different in how they read your website and index your webpages. So, when we talk about Search Engine Optimization (SEO) for Baidu, the process is different from the one you would use for Google. In order to rank higher on Baidu you need to use a SEO strategy which is pertinent to Baidu. Having your website ranked on the first page of search engines for certain keywords will bring you an immense marketing value. In SEO language, we have On-site SEO and Off-site SEO. On-site SEO is the process of making your website search engine friendly. Off-Site SEO refers to actions you can take to promote your website on the web (besides advertising). Your On-site SEO is originally developed for your Westerner audience and it is thus only optimized for Google, but not for Baidu. The Off-site SEO can also create issues in China. Some of the Off-site SEO tactics that are employed for Baidu (in order to make your site ranking favorably on Baidu) are not necessarily endorsed or condoned by Google. The obvious solution is to have different websites for different markets. If not, your website will not benefit 100% from On-site and Off-site SEO techniques for both Baidu and Google. A dedicated .cn website allows you to employ dedicated Baidu SEO tactics. Many websites are built using third-party codes from Google or other services blocked in China. Some use foreign Content Delivery Networks (CDN), which are also blocked in China. So, even if your website is not blocked by authorities, it is still partially blocked because of your website code. This is one of the main reasons your website loads slowly in China. For example, if you are using Google fonts or Google Maps on your website, it can create delays of 40-90 seconds for your page to load fully. When analyzing the code before localization of our clients, Copreci, one can see the links to Google Fonts. The solution is to replace your third-party codes and CDNs to Chinese equivalent ones. For example, Google Fonts with Useso Font (from 360). However, the consequence of changing from Google Fonts to Useso Font is the loading speed problem is now reversed, your audiences outside China will have a slow loading experience since Useso servers are located in China. Are you seeing a whack-a-mole never ending cycle here? The same conundrum applies to CDN as well (Chinese or Overseas CDN) and other third parties code. The solution to this dilemma is to create two copies of website so that you can freely employ any third party code or CDN of your choosing. A Content Delivery Network (CDN) is a network of proxy servers which enables the end-user to have better access to online content. CDN nodes are distributed throughout a geographic region and can improve page loading speed and increase the accessibility to content, images. Having a fast-loading website will be beneficial to your Chinese visitors, as a slow website will turn away a lot of potential customers as most of them expect your site to load less than 3 seconds. The Copreci global website hosted in Spain takes 50 seconds to load from China. As I wrote before, Baidu favors fast-loading websites. This leads to more of your webpages being indexed by Baidu. The more pages of your site are indexed, the higher the visibility of your website to your visitors when they look for you on the search engine. To have your website serve your human and bot visitors (the search engines) better, you should host your .cn website on a server situated closer to your users in Hong Kong, Japan or mainland China. A user expects a website to load in no more than 2 seconds. Choose a Chinese location for the test. Hosting your website in China requires you to have an ICP Beian License. When you submit your ICP Beian application to the MIIT, the governing body of the ICP Beian License, they expect your website to have no content and inaccessible. If content are to be found and your website is accessible, your ICP Beian Application will be denied immediately. Considering the officially stated time period by MIIT to get your ICP Beian approved is 20 days, it is really a deal-breaker to turn off access to your current international website until you get the ICP Beian approved. The solution to this is you acquire a separate domain, e.g. a .cn domain, apply for ICP Beian, clone a copy of your existing website to it (localizing it at the same time), and go online. As you can see that having a separate website for China will also help in this instance. Essentially, your existing website could still function properly while you wait for the ICP Beian to be approved for your China-focused website. The ICP Beian License is mandatory when you want to have a website in China. Websites which are not hosted on a Chinese server (and thus having no ICP Beian License) can be randomly blocked from mainland China. Nicknamed the “Great Firewall of China”, the system is based on certain criteria – like offending content (political, violent, X-rated), but also on other aspects that we may never know. Here is a useful tool to see which websites are blocked in China. If you don’t have an ICP Beian License, you are not registered with the Chinese authorities, and you are exposed to accidental blocking risks from the Great Firewall. Facebook, YouTube, Google, Vimeo, Twitter are just a couple of the websites blocked in China. Your website is your online business card and it plays a vital role in your integrated marketing campaigns, in both B2B and B2C fields. A website which ranks high on Baidu can also attract new leads and partners. Target SEM campaigns can be used to promote your company in certain geographical regions, in accordance to your business development plan. When choosing your domain name think about your Chinese end-user. I simply think that having a Chinese version of your website will not make the cut. Websites hosted outside China get randomly blocked by the Great Firewall. The same censorship mechanism can slow down or completely block your website if the code contains links to blocked websites – such as Google. The Chinese digital landscape and the Chinese netizens’ behavior are extremely different from everything you know on Western online markets. When adapting your website for this specific market you must go all the way!